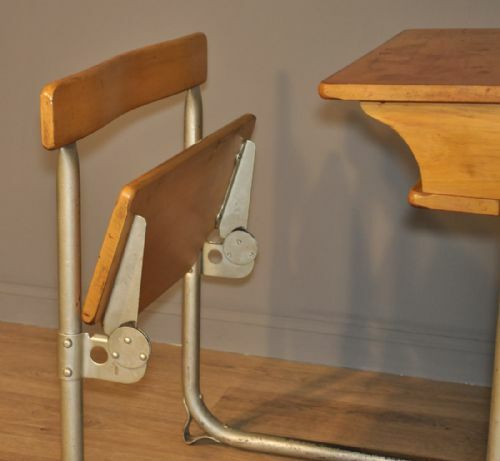 Attractive vintage child's school desk. A lovely school desk. We date this desk to the around the mid 20th century. There is a small stamp for 'James Bennet, Glasgow' to the rear. The desk sits on a tubular steel frame and has a lift up seat. The desk has a height of 32.5" (83cm), a width of 24" (61cm) and a depth of 33" (84cm). This lovely school desk remains in very good solid condition with only minor surface markings commensurate with age and usage. There are some minor marks and indentations to the finish. This remains a very usable children's school desk. It will continue to provide good service for many years to come.